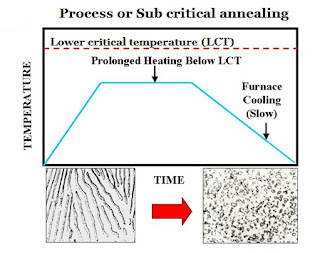 Another type annealing called Process or Sub critical annealing consists of heating the steel to a temperature first under lower critical point and holding at this temperature for the proper time (2-4 hrs) followed by air cooling. 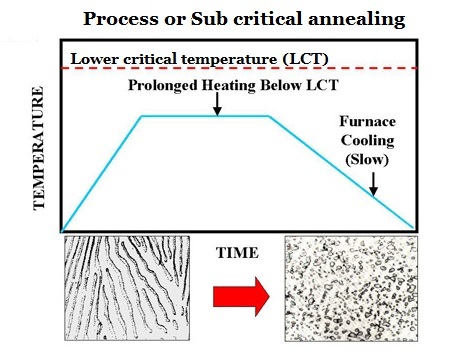 This type of annealing results in softening the steel due to particle coagulation of the carbide to form the spheroids or small globules of carbide. It is not suitable when a close control of hardness or structure is desired, because the prior structure of steel determined to a marked degree the extent of spheroidisation which will occur. This process is quite satisfactory for rendering bars more suitable for cold sawing or shearing and is used to great extent for these purposes. Since the temperature to which the bars are heated is somewhat lower than in full annealing there is less scaling and warping can be controlled.